Have a story that our community should hear? Open to experiencing the stories of students from other schools? 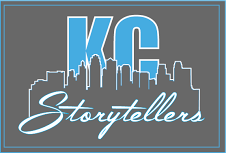 Want to be a part of the KC Storytellers Scholars team? Ask a teacher to nominate you.They won’t come with you to the workshops, but they’ll be able to check in with you through the program. What kind of stories will we share? True stories that you’ve experienced. But the stories can be in different modes — like oral stories you speak in front of an audience or short films that include visuals. It’s your story so we’ll help you tell it like you want to. Will there be food? Will this be fun? Yes! And yes! Oh, and we will also provide each Scholar with a $50 stipend since you’ll be making our community better by sharing your story. If you have already lined up a teacher to be your advisor at school, then complete the application by December 15, 2018. If you need help finding a teacher at your school to be your advisor, contact Katie at kkline@ucmo.edu. She can help.